Korea idol group, Super Junior member, Kim Heechul had expressed on a recent radio broadcast that he would like to have a ‘Foxy’ girlfriend who knows how to do aegyo. He has expressed that artist who always looks glamorous on the outer appearence are actually the ones who feels most lonely. Super Junior member Donghae had once made a wished, hoping that after the elevator door had opened, the girl who appear would be his life-time partner. However, he was always left disappointed. 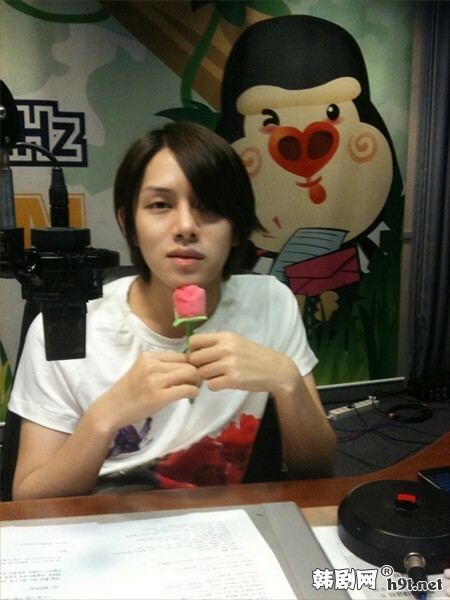 It’s a girl’s right to do aegyo to her boyfriend, Heechul added. He continued saying about how he wish a cute ‘Foxy Girlfriend’ would appear in his life. He even mentioned about the interesting stuffs that had happened in his everyday life. There was an incident whereby a man had called in the middle of the night claiming that he was ‘Lee Byung Hun’ and would like to have a candy kiss with ‘Kim Tae Hee’. Heechul who got agitated simply ended the phonecall and decided to play the same prank on one of his female friend. However, all he had said was ‘You’re so pretty’ and he ended the phonecall as there was nothing left for him to say. This entry was posted on September 7, 2010 by heedina. It was filed under Boy Band, News and was tagged with heechul, kim heechul, Super Junior, Super Junior Heechul.